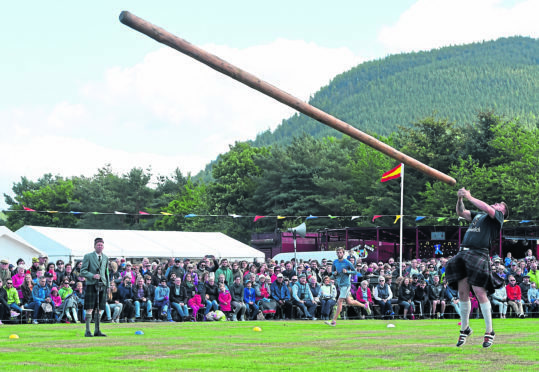 The summer sunshine held up its end of the bargain once more as thousands turned out to enjoy the Ballater Highland Games. Coming weeks after a hugely successful event just along the road in Aboyne, the temperatures and spirits were high as the weather’s hot streak continued. An estimated 5,000 people, but potentially more, attended the 153rd event at Monaltrie Park. A mix of locals and tourists alike cheered on the competitors who pushed themselves to the limit under the glare of the afternoon sun. As well as the thick local accents in the crowd, French, Swedish, American and German accents could all be picked up enjoyed the heavy events, the athletics and the traditional dancing. This year also marked a major milestone for the games chieftain, Captain Alwyne Farquharson of Invercauld, who attended his 70th event. The 99-year-old was piped in by the massed bands watched by a large contingent of the Farquharson clan. To mark the occasion, a special plaque was unveiled at the entrance to the park commemorating his many years of service to traditional sports. An array of strongmen, from the north-east and further afield, wowed the crowds throughout the day with their muscle-busting caber tosses and hammer throws. Those in attendance even got to see Aboyne heavy Jack Dawkins throw himself into the history books with a new local record on the light hammer of 127ft and 4.5ins. Meanwhile, the dancers jigged throughout the day, providing a colourful show for people as they entered the games arena. Another staple of the games proved popular among the spectators, the annual hill race for which scores of runners made their way up the wooded Craig Coillich. John Sheridan, who is well-known as the owner of the local butcher shop, is the chairman of the event. He said it had been another fantastic event and said it had been a hugely successful year around the games circuit. “The turnout has been as good if not better than last year,” he said. “The weather has been fantastic at all the games and we have been lucky again as you never know how it’s going to be. “This is the first year we ran an online booking service and 380 people used it, most of them were from Europe. “It’s also been special as it’s the 70th time Captain Alan Farquharson, our chieftain, has been here. He’s also 99 this year which is an incredible feat in itself.